Welcome to the $100 Room Makeover Challenge! My fellow DIY bloggers and I are each choosing one room and transforming it into a space we will love. The only catch: We can only spend $100 on the entire overhaul! 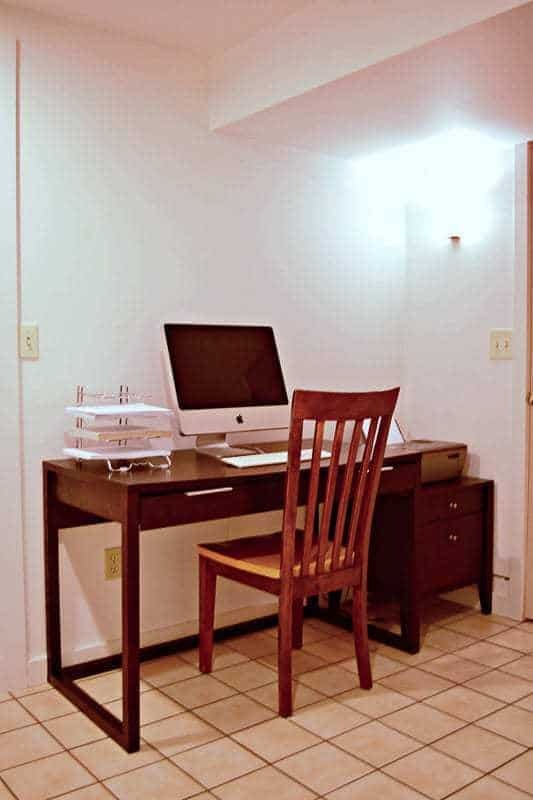 It took a lot of creative thinking and some furniture musical chairs, but I managed to complete my basement office makeover under this tiny budget. Our basement office does double duty as our laundry room, but I chose to ignore the washer and dryer side for this makeover. Nothing is going to make those 20 year old beasts pretty! The “office” was basically a depository for furniture that didn’t have a home after we moved in two years ago. The sagging desk held an old Mac that hasn’t been used in ages, and the printer cabinet was jammed full of scrap paper and old cables. Overall, it was just drab and boring! Because this room is right outside my workshop, it slowly became a dumping ground for tools and leftover materials. I thought the space would be better utilized as additional storage, with a small desk area for making notes as I worked on my latest project. Storage pieces can be expensive, so I had to get creative with stuff around the house if I wanted to come in under budget. My sewing room is almost never used anymore, now that my interests have migrated to woodworking. It was time to change things up! I cleared out the IKEA Kallax that stored all my old sewing notions and dragged it down to the basement. 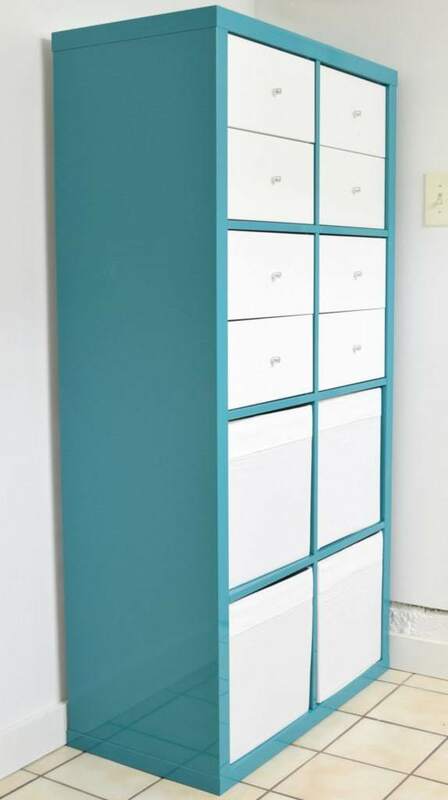 I discovered that IKEA no longer carries the turquoise version of the Kallax (sad!) You can find other bright or neutral colors at their store or on Amazon if you don’t have an IKEA near you. I love the drawer inserts for smaller items, and the Drona boxes fit in the squares perfectly. You can also find a wide variety of inserts online. 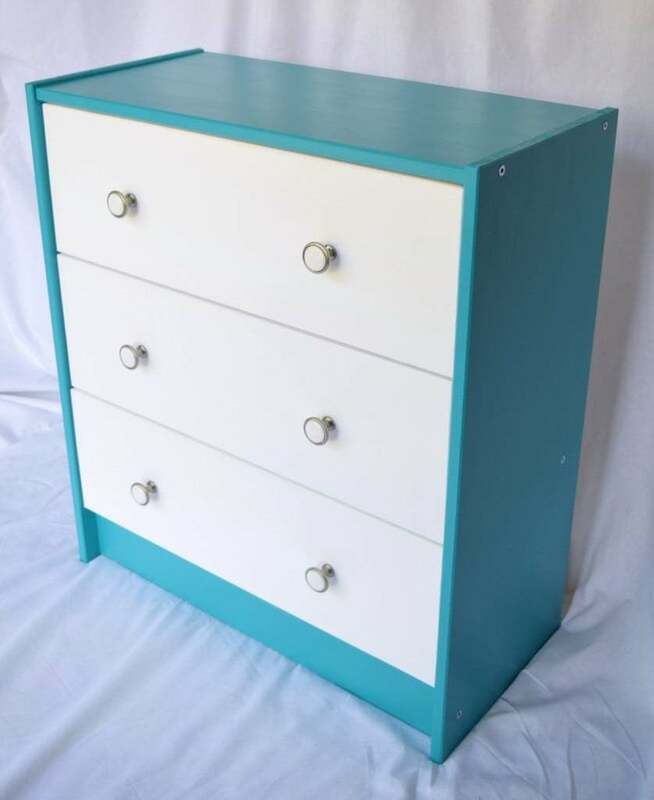 Taking inspiration from the bright turquoise and white Kallax, I painted an inexpensive IKEA Rast dresser to match. 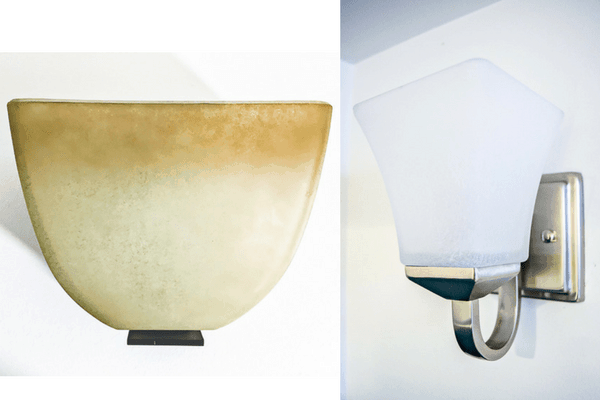 These two pieces will infuse some much needed color into the space. To create the desk area, I spanned the gap between the Kallax and Rast with 1 x 6 boards. 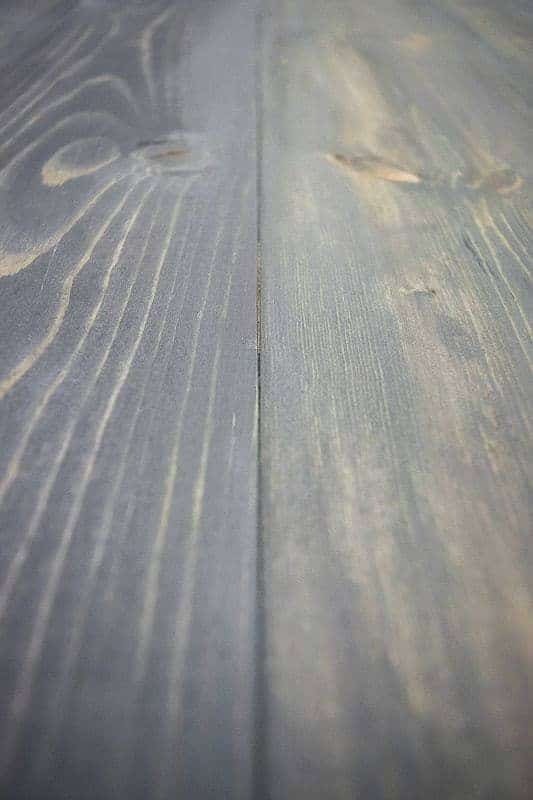 These boards were planked together with my handy Kreg Jig, then stained charcoal gray with Minwax water based stain. 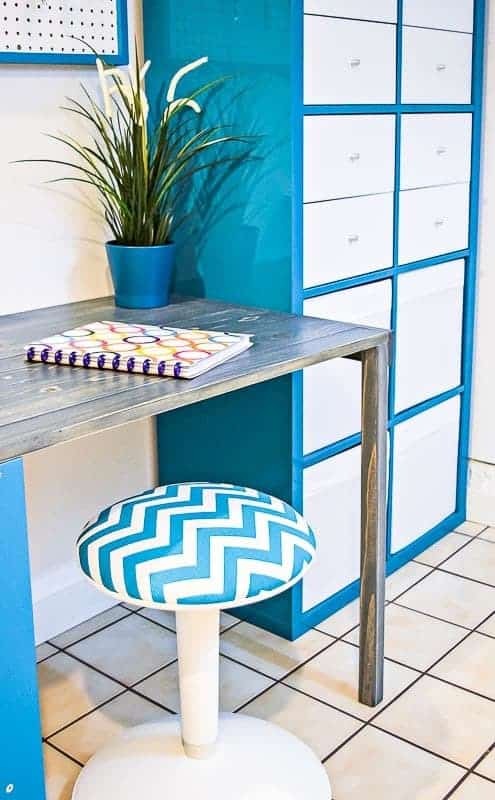 A full tutorial of this easy IKEA desk hack can be found here! Above the desk, I installed a pegboard to hang all the tools and supplies that I didn’t want to get covered in sawdust. Nothing ruins a good paint brush faster than dust! I had a scrap piece of pegboard left over from the one I hung in the workshop. To raise it off the wall so hooks could get behind it, I put together a backing using scrap 1 x 2’s. To cover up the rough edges, I framed the entire pegboard with preprimed 1 x 2 scraps left over from my outdoor storage bench project, and painted the frame the same color as the Rast and Kallax. 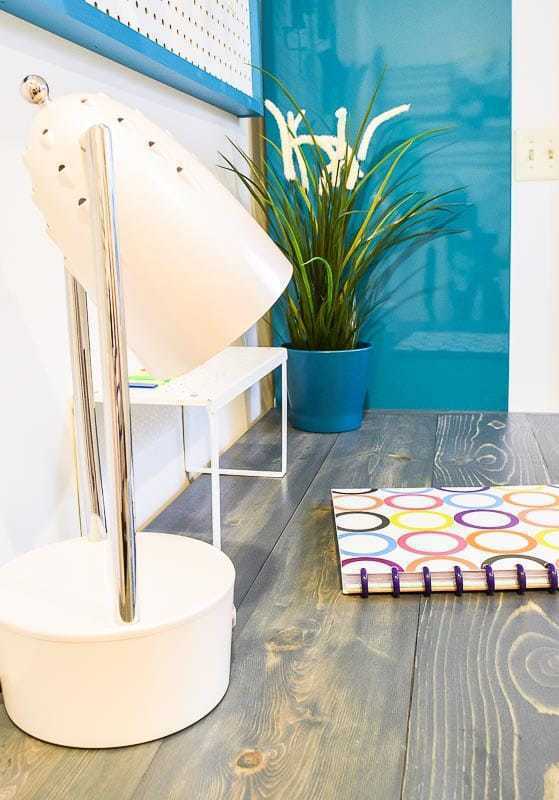 I ditched the old, dingy light fixture for an inexpensive but modern alternative. The white shade gives the space much brighter light than the brownish one I was replacing. The brushed nickel finish also coordinates with the hardware on the Rast dresser. A few last touches, like the fake plant, table lamp and wall clock, were taken from other parts of the house. The woodworking books are now close at hand rather than on a shelf upstairs. And my project notebook finally has a home instead of cluttering up the coffee table in the living room! The grand total for the entire makeover was $97.11. I can’t believe I completed the challenge for under $100! I actually enjoyed scrounging around the house for pieces I could use rather than spend money on new stuff. My scrap wood pile is a little smaller too! My basement office looks like a completely different space now, and will be so much more useful. I can’t wait to start filling up those drawers and bins with all the little things that have been cluttering up the workshop. Want to see how my fellow bloggers did on their $100 Room Makeover Challenge? Click on the links below to check them out! Your office turned out so cute! Great job! Wow I love it I want to work there . It’s amazing what a little paint can do! Well done! I love the accent colour! Well done so much fresher, love the colour. 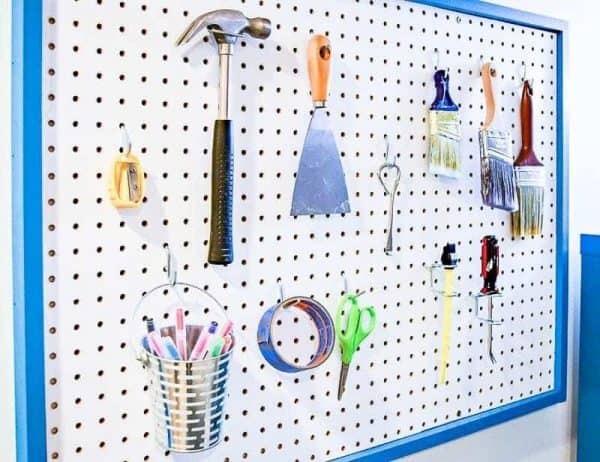 Especially like what you did with the peg board I need one for my craft room. Love these bright colors. What an adorable and inspiring place to work. Great job on executing your $100 makeover plan. Are you sure this is the same space? It turned out ridiculously beautiful. 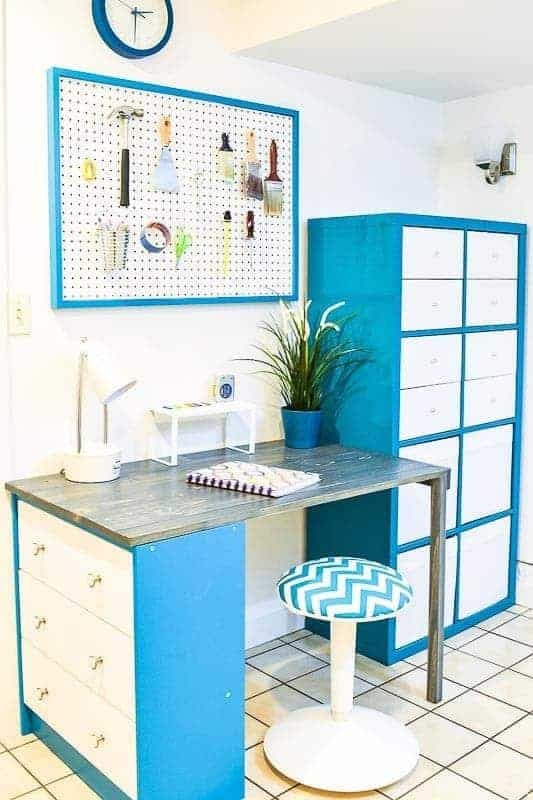 I love the color you chose and pegboard never looked so good. So much to love about this space. You did an amazing job. Love the storage you created! The color just makes this office! This is one of the prettiest offices I have seen. Great job with $100. I so want to come and play in your office!!! What a fabulous makeover! I bet there will be plenty of awesome projects created there! I love the colours that you chose too! Spectacular makeover!! What a bright and happy space you made your office into. The workstation is really nice and so function. It is a great place to work. I love your reveal!! That desk is awesome!!! The space looks a lot brighter! Stopping by from the Inspiration Monday party. Love this! You have space and I love the peg board especially. Pinned it so I can come back and visit the rest. Thanks for sharing with us at Merry Monday.